Less Is More. Small Is Big. 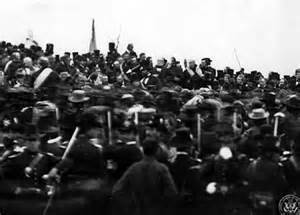 The presentation of the Gettysburg Address. Lincoln stands in the center with no hat. I was listening to National Public Radio on the way to work this morning, and caught the tail end of a feature on the Gettysburg Address. Apparently, today is the 150th anniversary of its reading. There’s a lot of mythology that has built up around it, one of them being that Abraham Lincoln wrote it on the back of an envelope on the train to Gettysburg. I also remember hearing that Lincoln was the last of several speakers that day, several of which were quite long winded. The Gettysburg Address is not long at all, but I think that is one of its saving graces. When I teach my classes, I try to remember the statistic that students remember about 10 percent of what they hear, 25 percent of what they read, and maybe 60 percent of what they do. Further, the human brain checks out after the first 15 minutes or so. So when I preach, I try to keep it short and to the point. When I teach, I try to involve students as much as possible. Being long winded is the least effective way of communicating. 1. Be short. Be direct. There is a value in description, but you need to remember why you include description, and only put in what is necessary. Time and time again I read of famous writers who write their first draft and then end up cutting 20 percent of their copy. There is wisdom in that. We tend to repeat ourselves in our writing and go off on tangents. That’s what you look for when it comes time to cut. 2. Appropriate words in a critical time. At any other time, the Gettysburg Address would have probably been forgotten. But not only was this commemorating the biggest battle, and the biggest success, for the Union in the Civil War, it was making a statement about the Emancipation Proclamation, which had been passed earlier that year. The Emancipation Proclamation would change our nation like no other bill or law has before or since. This was Lincoln’s opportunity to say something important, to give the new bill historical context. Most of us won’t get to write something as critical to so many people’s lives as the Gettysburg Address. But that doesn’t mean our words won’t impact other people. I have had people tell me several times that my words–written or spoken–have made a difference in their lives. And that’s been a richer reward than any money I ever earned. After that’s what it’s all about, isn’t it? Making a difference?